Campbell’s Greenhouse and Garden Center is located in Randleman NC and serves customers in Asheboro, Archdale and Ramseur. We provide all of your landscaping needs including lawn and garden supplies, trees, shrubs, flowers, mulch, concrete and pet supplies. At Campbell’s, our goal is to provide our customers with the best variety and highest quality of plants, lawn supplies and home and gardening tools. Our professional and friendly staff of gardeners and designers are eager to assist you in developing the garden and landscape of your dreams. At Campbell’s Greenhouse, you’ll find a large selection of annuals, gorgeous hanging baskets, perennials, a number of ornamental trees and fresh and flowering shrubs. 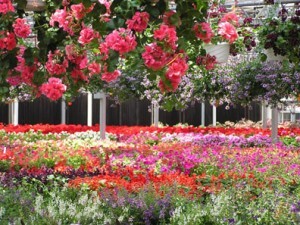 Our large variety of plants appears endless as you stroll the greenhouse in search of your perfect landscape ideas. Stop by and see us in Randleman this Spring. We are open Monday – Friday 9:00 – 5:30, Saturday 9:00 – 2:00, Sunday – Closed The flowers are fresh and ready to brighten up your home or business!